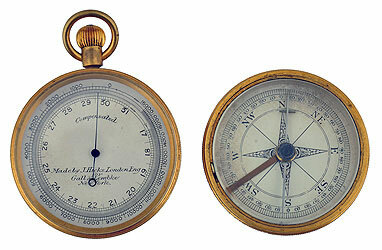 Pocket barometers were used by hikers and balloonists since they double as an altimeter as well as being a barometer. Starting at sea level 1/10th of an inch of barometric pressure is lost for every 90 feet ascended, so travelers can handily determine altitude. 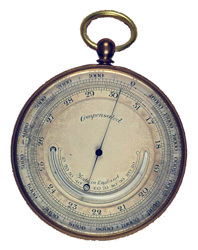 Pocket barometers use the same mechanism as the larger aneroid barometers, but in miniature. 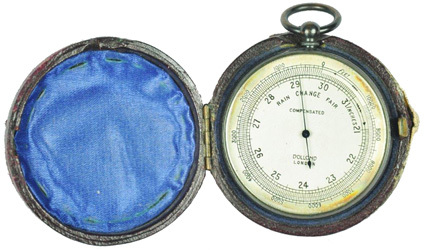 These barometers typically came with nice cases, similar to the one pictured above. When we have the case, it is noted in the description, even if the case is not pictured. When these barometers appear with American names on them, they were actually made in England for the named company. On the outer rim there is often a rotating bezel; one can set the zero on the bezel opposite the barometer hand, and can read altitude during climbing. We note this as "Rot. Bez." in the descriptions. 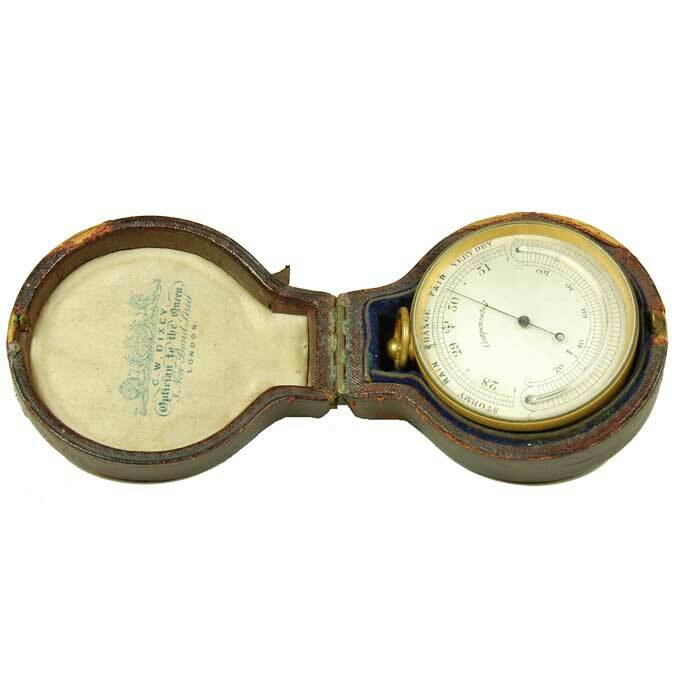 Pocket barometers in our collection were made from about the 1860's to the early 20th century and all are in working order. Please call for more information. 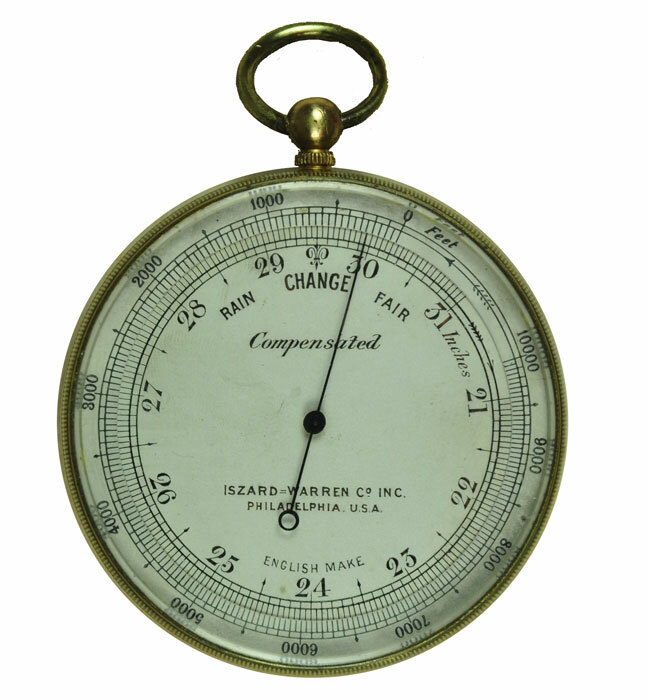 English made pocket barometer for Iszard Warren Co of Philadelphia for the US Coast and Geodetic survey. 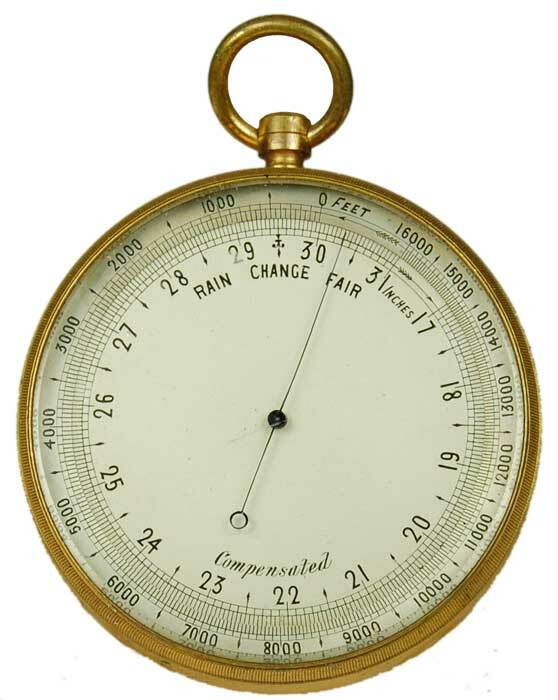 Pocket Barometer. Pinkham & Smith, Boston. 2-3/4" dia. Rot. Bez. 0 to 8000'. Case available. 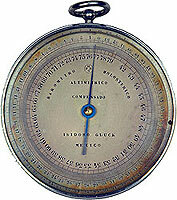 Pocket barometer made by Hulot and Naudet in Paris for Isidoro Gluck in Mexico. 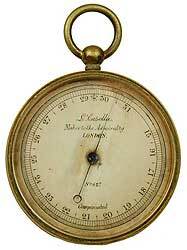 Calibrated in centimeters. 2 3/4" diameter. Chrome finished case. 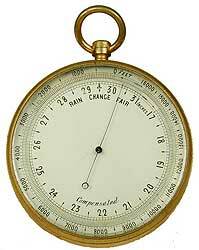 Pocket barometer. L. Casella, Maker to the Admiralty. 2" dia. Pointer bezel. Scale 31 to 15 inches. Pocket barometer with curved thermometer. 2 5/8" diameter. Altitude scale 0-16000 feet. 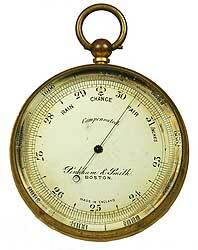 Pocket barometer. Marked "Compensated". Rot. Bez. 0 to 16,000'. Scale 31 to 17 inches. Case available. 2-3/4" dia. 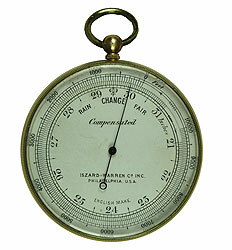 The most unusual pocket barometer we have ever had. 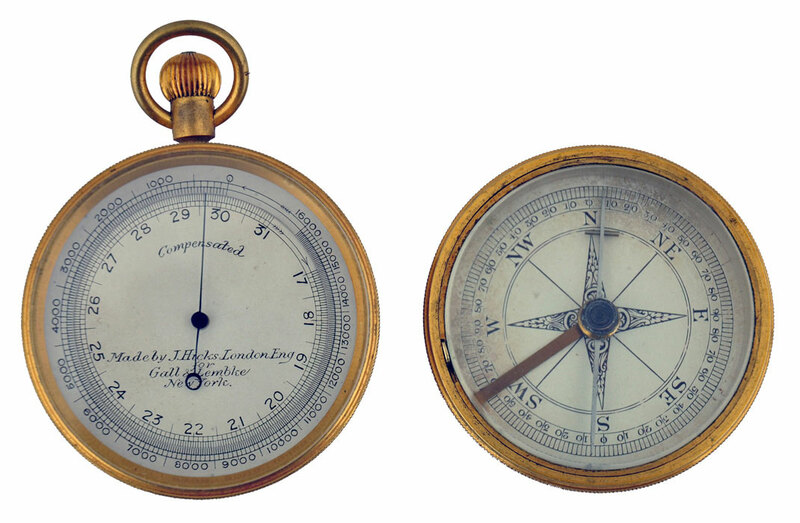 The compass screws onto the back of the barometer. 2" dia. 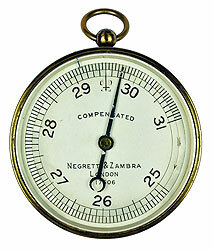 Superfine pocket barometer made for JW Queen & Co., Philadelphia, PA. In it's original case. 2¾ inch dia. 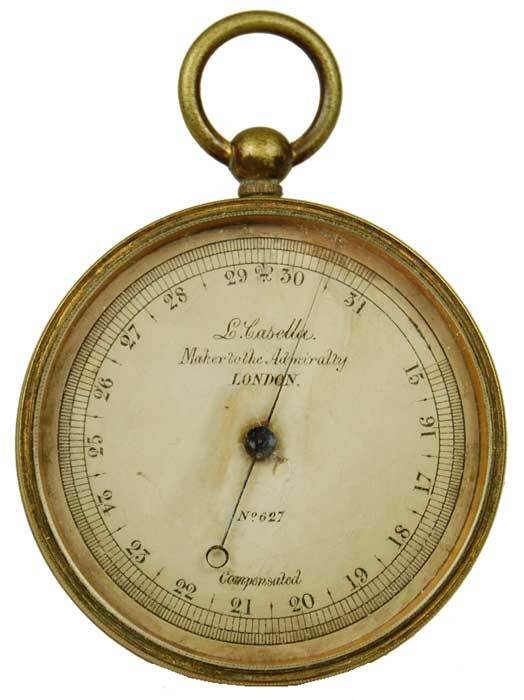 Pocket barometer by Dollond. Altitude scale 0-10,000 feet. 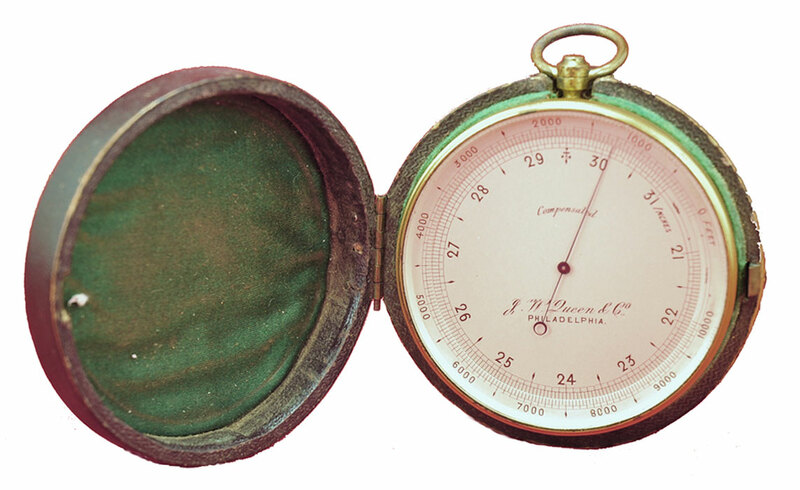 1 7/8" diameter with case.